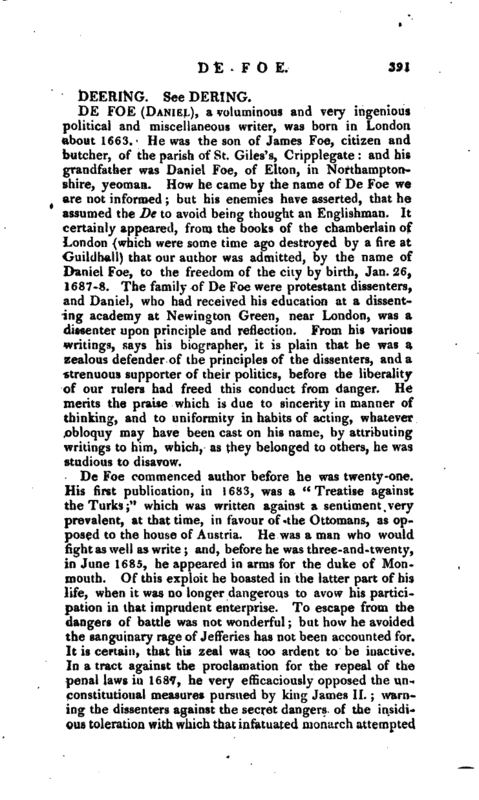 , or Doering, an ingenious but unfortunate physician, was a native of Saxony, who took his degrees in physic at Leyden, and came to England, according to Mr. Martyn, in the train of a foreign ambassador; but another account pays, that soon after he came to London he was appointed secretary to the British ambassador at the Russian court. Both accounts may probably be true. 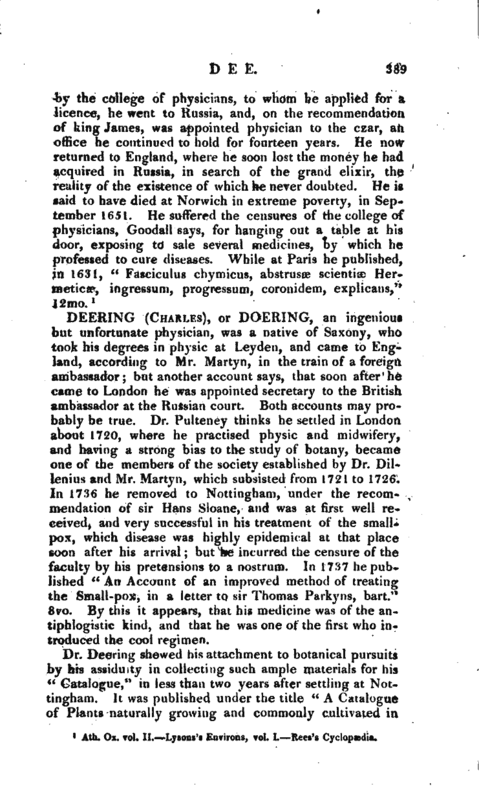 Dr. Pulteney thinks he settled in London about 1720, where he practised physic and midwifery, and having a strong bias to the study of botany, became one of the members of the society established by Dr. Dillenius and Mr. Martyn, which subsisted from 17*1 to 1726. 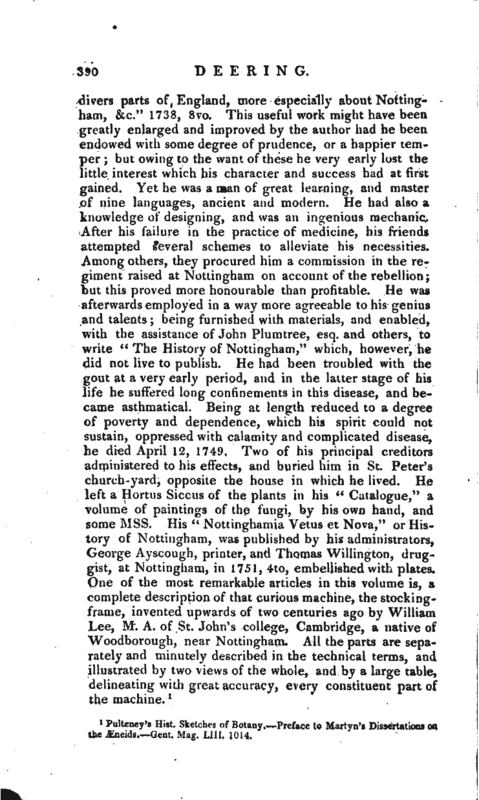 In 1736 he removed to Nottingham, tinder the recommendation of sir Hans Sloane, and was at first well received, and very successful in his treatment of the smallpox, which disease was highly epidemical at that place soon after his arrival; but he incurred the censure of the faculty by his pretensions to a nostrum. In 1737 he published “An Account of an improved method of treating the Small-pox, in a letter to sir Thomas Parkyns, bart.” 8vo. By this it appears, that his medicine was of the antiphlogistic kind, and that he was one of the first who introduced the cool regimen. Pulteney’s Hist. Sketches of Botany. Preface to Martyn’s Dissertations on the Æneids. —Gent. Mag. LIII. 1014.